He really struggled with respect towards other children and adults. He joked in hurtful ways with almost everyone, and often got in trouble for not following instructions. He was easily angered and would throw major tantrums over seemingly insignificant things – like being told it was time to leave. But our Home Parents and staff continued to work with him to empower him to overcome and choose positive responses. In the beginning, he focused on himself and his consequences following a melt down. When he created a scene or threw a tantrum, he would merely express regret that he got in trouble. Now, less than a year later? The tantrums are becoming fewer, and he is realizing after the fact that the behavior really was inappropriate and expresses genuine remorse. Thus, he was allowed to go on an amazing outing on the last Saturday of March. 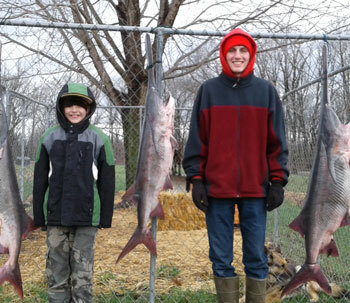 Our Property Manager and Vocational Skills Instructor, Sam Coy, took Curtis along to the Lake of the Ozarks to snag for paddlefish. Sam picked Curtis up at 3:30 in the morning, drove to Versailles where they had breakfast, and were putting their boat in the lake by 6:30 a.m. It turned out to be a miserably cold and rainy day. 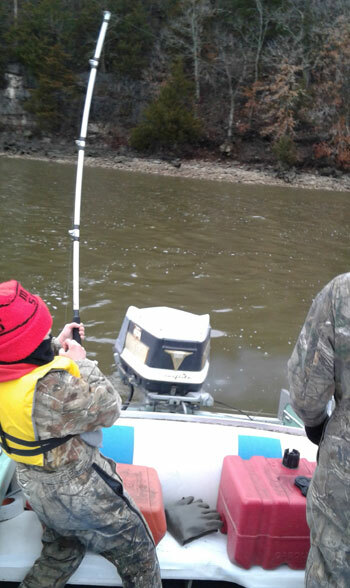 Yet Curtis stuck with it all morning, and the group of them caught three great fish before calling it quits at noon…just before it started snowing. Curtis’ Home Parent mom concludes, “This spring, as we’ve been doing a deep cleaning and purging of excess stuff in our home, we’ve involved the kids in the process. They’ve all been working hard and doing well. After one Saturday of working, we took the kids to a fast food place so they could pick out whatever they wanted for supper. Curtis’ sister has been avoiding sugar and when Curtis was ready to place his order he stopped, turned to his sister and said, ‘Wait. Since you can’t have sugar, I won’t get anything with sugar, either.’ So instead of ordering the soda that he wanted, he asked for water. Thank you. Your support allows abused and neglected children to experience a safe place to be a child, and so much more. Children like Curtis are learning how to interact with and treat those around them, a skill they will carry with them the rest of their lives.